Whether you’re dealing with chronic pain, moving toward optimal health, getting in shape or seeking relief from stress, it can be difficult to know where to turn for approaches that support your WHOLE being — body, mind, and soul. That’s why I’m inviting you to join me for Winter of Wellness, which brings together 30+ top doctors, teachers, and healers in service to your holistic health. This exciting series will be full of innovative insights and techniques that can empower you to take control of your health and wellbeing. Embark on a journey that can SUPERCHARGE your whole life and revitalize your family, your friends… and even your community. I hope you’ll participate in this FREE online series, which will expand your horizons and open you to new levels of wellness in all areas of your life! 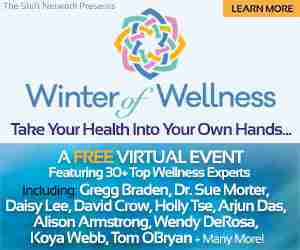 RSVP here for Winter of Wellness — at no charge! Register for this amazing event — and get ready to experience integrated health, healing, and wellness for your entire being… body, mind, and soul. Overall EXTREMELY well done. Very good moderation and information. Offered in easily integrated way. — Steven W. Evans, Hawaii, U.S. The Winter of Wellness Summit is consistently top notch. I am left inspired and energized, with renewed hope for the future and faith in my fellow man. The speakers are phenomenal. What a treasure! I was very impressed with the diversity of fields presented and the balance overall. I am not new to many of these but still found new and very interesting information and techniques. I already feel healthier and am pursuing follow-up with some of the presenters. Thank you so much! — Sherry, Smokey Mountains, Tennessee, U.S.
I’ve been a WoW listener since its inception. It’s always been cutting edge. With so many rapid advancements in wellness, every year is better, filled with even more health-invoking insights! I’m so grateful for the very valuable info I was provided, which I can share with others as well to make a difference! It was definitely well worth my time! I highly recommend it to others. Thank you so much for all the efforts of everyone! Great job! — Haidi, Schaumburg, Illinois, U.S. Enjoyed the enormous diversity. Feel enlivened and optimistic about my ability to create more vibrancy in my life. WOW — well named! The speakers I was able to listen to blew me away with their knowledge and generosity. I truly enjoyed the informative summit. It was a wonderful experience to hear so many speakers talk about health, life, journeys and struggles. It is a true gift to be able to have all of this information at my fingertips. Thank you so much. Tagged being, energy, healing, Health, keys, peace, summit, wellness, whole.